When you’re on holiday, you want a good night’s sleep so you can wake up rested and ready to conquer the day. However, if you decide to go camping for your holiday that doesn’t mean you have give up a restful night. A sleeping bag makes a big difference in how you get a decent sleep, but with so many on the market it can be hard to know which one to buy. Looking for a comfortable, high-end feeling when you snuggle up in a sleeping bag? Then you might look into the Western Mountaineer Alpinite. This three-season sleeping bag comes in three sizes, which is handy since it is a rather snug fit due to its mummy shape. So make sure you check measurements so you’ll feel comfortable. It includes a neck baffle to keep warm air in, but you may not need it since reviewers said they stayed very warm. Reviewers said the zipper is great — no snagging on this one! Cost is about $600-$700. Priced around $100, you’ll find this sleeping bag is rated as one of the top sleeping bags of 2017. It is a traditional rectangle shape and may not be fancy, but reviewers say it is extremely comfortable and very warm. You know, all the things you want in a good sleeping bag! Plenty of room in this one, so don’t worry about your size, and since you’re just rolling it out at a campsite, then no need to think about the fact that it’s a little heavy. This particular sleeping bag has long been a favourite of campers who don’t mind shelling out over $200 for it. If you use it enough, and as a reviewer said it feels like you’re sleeping at home in your own sheets, then you might feel like it is worth it. Plus, it has some cool extras such as a zip-off storage bag that could be used to store camp equipment. The quality construction will also make you feel good about your purchase. You’ll find eight different variations under the umbrella of the Mont Tapered Rectangular — but they all carry the same shape and style, just better for colder weather or larger people. But what you’ll find with all of them is that reviewers like the shape, length and even the hood as well as the fact that it’s a hardy bag. You will have it for years to come. The only thing people said that is slightly negative is the zipper is located in an odd place so it takes awhile to get used to it. Costs over $500. 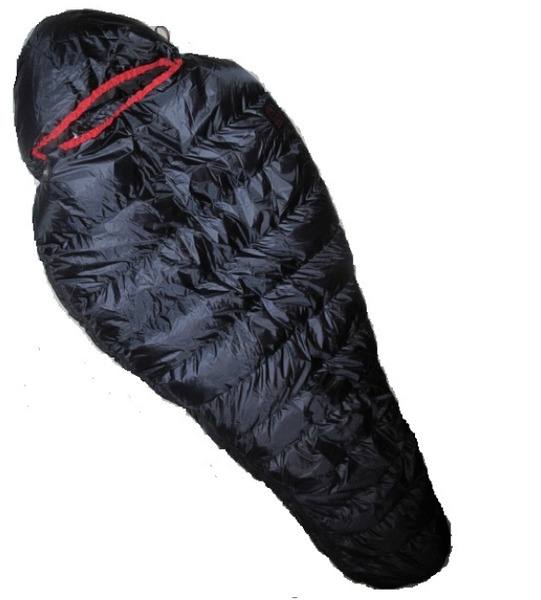 As the name suggests, this sleeping bag is extremely lightweight. The Malachowski Ultralight is down filled and very warm. It also has lightweight fabric made in Japan. The mummy-shaped sleeping bag uses a patented baffle technology so the down filling won’t shift when you move around at night. If you’re a cold sleeper, then this might be the bag for you! It retails for about $400. While this isn’t our most cost efficient sleeping bag, the Marmot Plasma 15 feels worth its price tag when you experience a night of sleep in it. This warm sleeping bag certainly will do the job for any nights in Australia at a rating of -9 degrees Celsius. The one thing you’ll need to remember is to be careful with the zipper; reviews said it can be an issue. But keep in mind how warm you’ll be, and you will be very comfortable in this down filled sleeping bag (but you’ll still want to have a mat!). Cost can be in the upwards of $900, but people said to shop around because you can snag it for a lot less overseas (more like $300-500). If you and your mates tend to go camping together and there is usually an issue with space in the car or tent, then this might be a good investment sleeping bag. The 700-fill down makes it super lightweight, but that doesn’t mean you lose space. You’ll find this bag still has massive leg room so if you’re a bigger guy, you can still use this sleeping bag. It’s not quite as soft as some sleeping bags with cotton flannel interiors, but if you’re more worried about space and weight, then this is your bag. Check out this sleeping bag if you’re a bigger person – a large, tall man would really appreciate the huge amount space found in the Darche Cold Mountain Monster Size. It is 250 cm by 114 cm – they weren’t kidding on size. The Darche Cold Mountain also features siliconised hollow fibre, which is known for trapping air well that in turn will keep your body warm. Costs about $160. This all-weather sleeping bag is perfect for any time of year. It features a summer compartment made from Synsilk and a lightweight covering. However if it is winter or just particularly cold, then use the winter compartment, which has a flannel lining. One cool feature is a zippered, hidden chest pocket. Might make a great place to put your wallet or other items you want to keep close to you. Runs about $200. No matter what sleeping bag you pick, bring it with you when you head out on your Byron Bay camping holiday. We recommend putting down your tent (and your awesome sleeping bags!) 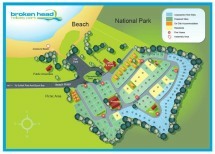 at Broken Head Holiday Park where you’ll enjoy both the quiet beachfront location that is only a short drive to downtown Byron Bay, and upgraded camp facilities. We have both powered and non-powered campsites, so no matter how off the grid you want to be on your camping holiday, we’ve got you covered.